Teatro Duque - Sala La Imperdible. Free entry until all seats are filled. Municipal Recipes is a documentary about how we’ve gotten to this point, where citizens from new political subjectivities are experimenting with organisational models in order to manage institutions. 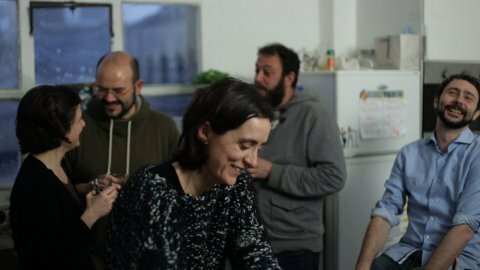 The documentary features people linked to various social movements and the new municipal «confluence platforms» that are taking root in Spain. They include: Gala Pin, from the Mortgage Victims Platform (PAH) and the municipal candidacy Barcelona En Comú; Pablo Carmona, from the Fundación de los Comunes and Ahora Madrid; Marta Cruells, from Barcelona en Comú; Francisco Jurado, from Democracia 4.0 and Open Euribor; and Guillermo Zapata, from the Patio Maravillas social center and Ahora Madrid. As they share a meal together, they discuss the various questions and issues that frame the historical moment, trying to push forward a new world that is opening up. After the screening, the filmmakers will be available for a Q&A session where, among other things, they will explain why they feel municipalist idea, as a political project, plays a fundamental role in the management of common goods. This documentary was filmed as part of the Doc Next Network’s Radical Democracy: Reclaiming the Commons project. Its Spanish hub is a medialab composed by Guillermo Zapata, Nuria Campabadal, Mario Munera and Lucas Tello and coordinated by Sofía Coca, of ZEMOS98.